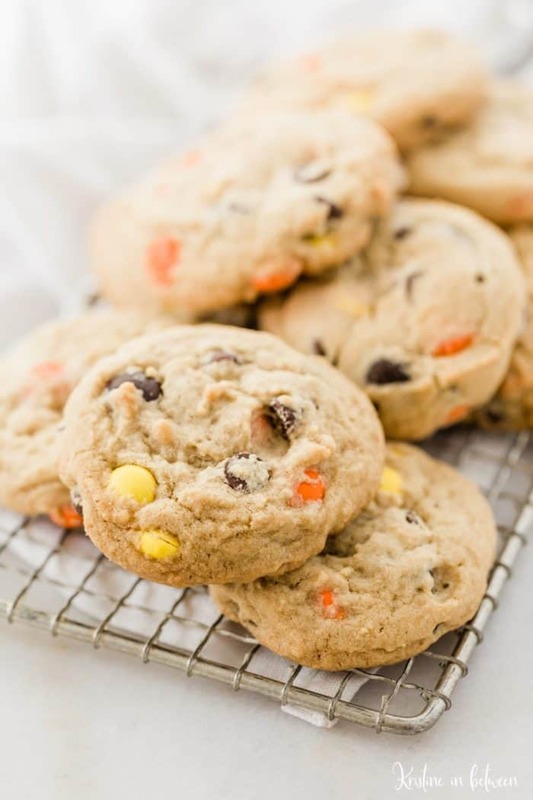 Reese’s peanut butter cookies are thick and chewy and loaded with Reese’s pieces! This easy cookie recipe is made in just one large bowl for easy clean up. 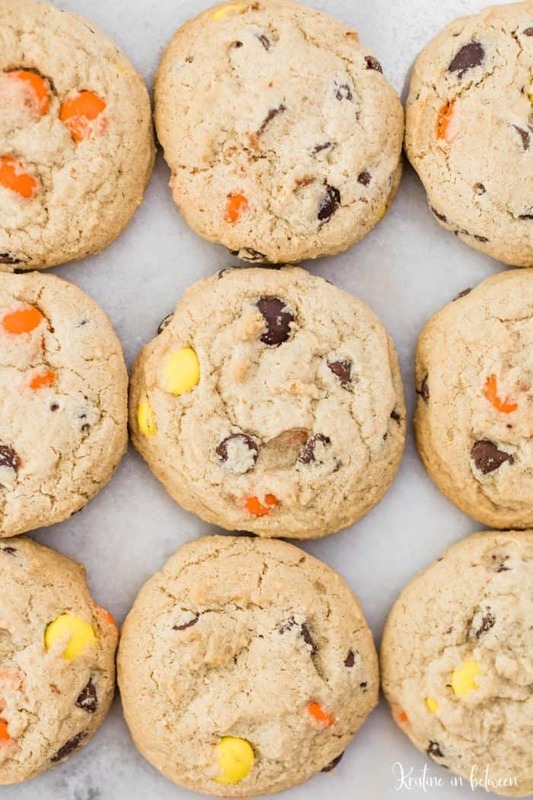 You need to try these peanut butter cookies with Reese’s Pieces. Well hello there you chunky little Reese’s peanut butter cookies you, don’t you look delectable? Oh yeah. It’s Kristine here from Kristine in between again with yet another show-stopping cookie recipe for you! I don’t know about you, but I’m not one to ever turn down anything peanut buttery, especially if it involves Reese’s pieces, so when I baked these Reese’s peanut butter cookies the first time, take a guess who ate Every. Single. Cookie? *looks awkwardly away* – yeah me! They’re literally that good! I’ve been in, what I call a ‘healthy baking’ phase over on my blog for about a month or so now. I’ve been doing lots of healthier recipes over there; I’ve done two new gluten-free cookie recipes in the last week! I’ll link to those down below, you know, juuuuuust in case you’re interested. And while that’s all well and good, when it came time for me to do this post, I was beyond excited to create an indulgent and rich cookie again! 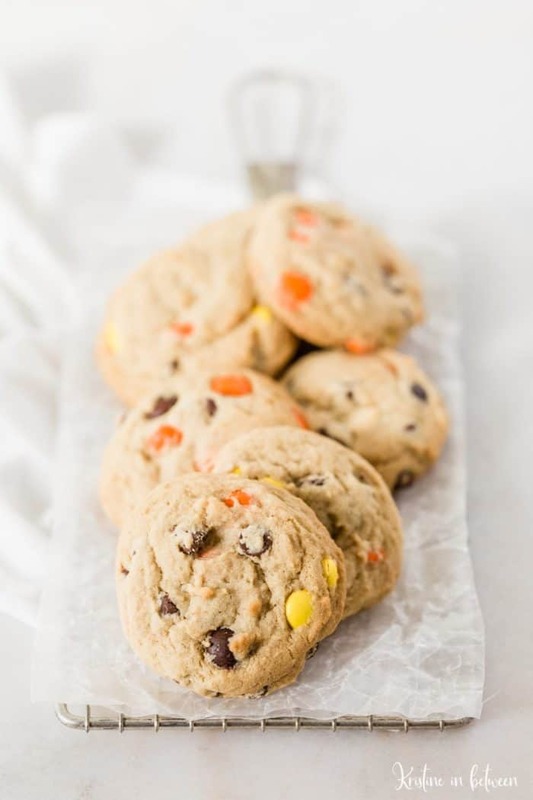 The first thing that came to mind was chocolate and peanut butter, and what better way to do that than with Reese’s pieces IN A COOKIE?! 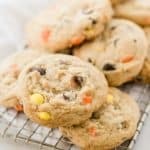 When I started writing out this recipe, I thought about how I wanted the cookies to be in the end. I knew I wanted them to be thick and hearty, so I added chocolate chips in addition to the Reese’s pieces to really give them some chunk. And I knew I wanted the cookie to be chewy too, but substantial and not too thin, so I used mostly brown sugar for some lift and chew. I also knew I wanted this to be a simple one-bowl, small-batch recipe, so I kept the ingredients simple, and common, and made the process easy. Chocolate chips (any kind, though I used semi-sweet). Milk (dairy or nondairy is fine). Making these cookies is easy-peasy and you can do it all in one large bowl. Once you pop them in the oven though, that’s where the magic begins. They slowly start to melt into themselves and spread as they bake, but the tops will puff slightly before eventually falling to create a slightly wrinkled top. 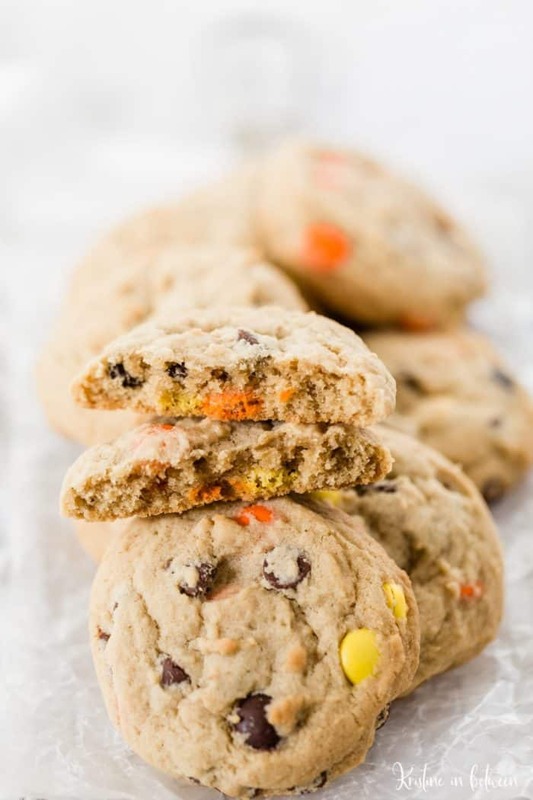 The center of the cookies remain soft and chewy, but the edges are perfectly crispy. And I personally love the little snap you get when you bite into a Reese’s pieces! 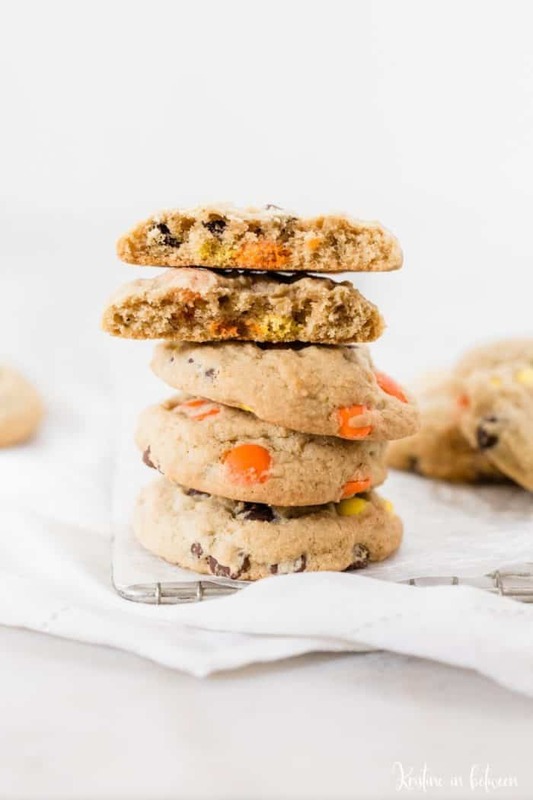 Neither the peanut butter or the chocolate are overpowering in this cookie, the just go perfectly together to create a mouthwateringly delicious chunky Reese’s peanut butter cookie! In a large bowl, cream butter and sugars together until smooth and light yellow in color. Add in the sea salt and baking soda and stir to combine. Stir in egg, vanilla extract, and milk and mix well. Add flour, half at a time, mixing until just combined. Fold in chocolate chips and Reese's Pieces. Using a 3 TBS cookie scoop, scoop dough onto lined baking sheets two inches apart. Bake for 12 minutes, rotating halfway though. Allow cookies to cool on the baking sheet for 5 minutes before transferring to a wire rack to cool completely. *I only get 6 cookies per half-sheet size baking pan. **Both the cookies and the cookie dough may be frozen. Bring dough up to room temperature prior to baking. 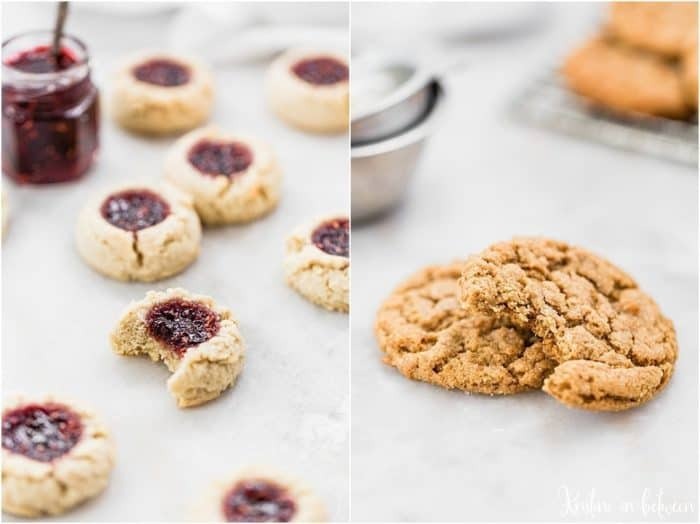 If you’re looking for indulgent cookies, stop by and check out my brand new cookie index or try one of my new gluten-free recipes, like these almond flour shortbread cookies or these flourless peanut butter cookies! They’re so tasty no one will notice (or care) that they’re gluten-free. And that’s a promise! Hi there! I’m Kristine the cookie baker, photo taker, and fitness lover behind the lifestyle blog, Kristine in between. I believe in finding balance between health, happiness, & lots of homemade cookies!